There is no way that I’m going to tell you where David and I had one of the best float-hunting experiences of our lives. No way. I will not tell you where we slipped our canoe into the creek and spent an entire day on the water without seeing another human being. I will not tell you how to get to the creek bend where I downed a bona fide triple on mallards. Nor will I tell you where we gently, easily, with so much stealth that it hurt, paddled up on wood ducks so close I could literally see them breathing. But I will tell you this: We’re going back. We’re going back because float-hunting is one of the best ways to ensure that you will grill out fresh duck breasts this hunting season. There’s no doubt in my mind that it’s the best way to hunt ducks without the benefit of a dog, decoys, duck call, or most other waterfowling gear. But it’s not as easy as it first appears. You’ll dramatically up your odds of dining on mallard, mushrooms, and ‘maters by planning every venture afield with a field commander’s attention to detail. So, quit your begging. I won’t tell you where to go. But I will tell you how. Hunting ducks from a canoe seems deceptively simple: Push a boat into a creek and hope for the best. Such a beginner’s approach, however, will score you numerous views of the posterior ends of flushed fowl, yet few chances to pull the trigger. Gunning by paddle is a great way to beat the crowds, and it’s very effective during bitter cold snaps that freeze swamps and ponds, but it’s also easy to do poorly. Here are ways to separate yourself from all the goons who slosh down the creek in a battered aluminum canoe. Cutting the distance between you and duck stroganoff begins with the proper craft. The quietest canoes are made of acrylonitrile butadiene styrene, or ABS, a common material for durable, general-purpose boats. (Royalex is a common ABS brand.) Fiberglass is next-best, as long as your stretch of stream is free of hull-shredding rapids. Far behind are aluminum canoes, which are akin to paddling a tambourine and hang up easily on rocks. If you must float in a metal boat, dampen the decibels by lining it with outdoor carpeting or old carpet samples. No matter what you paddle, soundproof the rest of your gear: Zipper pulls, pockets full of shells, even the tiny metal tabs on glove cuffs will produce clinks and clanks loud enough to send a preening pintail scrambling for daylight. Camouflage gloves and face nets are crucial, too, in addition to jackets and pants. Brush up the bow of the boat with evergreen boughs or beech limbs—the leaves hang on well into winter. I’ve changed my mind in recent years about boat camouflage—these days I load the bow of the boat with brush, and even camouflage the gunwales and stern. It makes paddling more difficult, but it’s definitely worth the trouble. And don’t forget that ducks will be flying overhead. You’ll have a better chance at pass shooting if the inside of your canoe isn’t littered with doughnut boxes. Knowing how ducks use rivers will help you see them in time to craft an approach. Often your best shots will come at sharp turns in the stream. Ducks also tend to raft up behind fallen trees and trapped river debris. Many are the times a limit’s worth of wood ducks has exploded from the river after I passed a tangle of downed branches. Creek mouths are also prime loafing spots, so approach them with the canoe held tightly to the bank and the bow gunner ready. It’s also a great idea to paddle up tributaries; off-channel beaver ponds and swamps often hold a load of ducks. Flush them from their hidey hole, and they might just pitch in downstream—which is where you’re headed. Wear a life vest. No exceptions. Ever. Spring for a good paddling vest designed for sea kayakers and whitewater canoeists; the yoke-style cut affords freedom of movement and won’t hamper a mounted gun. Carry only one loaded gun in the boat. Never wear waders while paddling a canoe. You’ll also benefit from learning a simple bracing stroke. If the canoe starts to tip over, extend your paddle over the water on the side of the boat that’s rolling, turn the paddle face toward the water, and push down—hard—on the paddle. It’s an instant outrigger. The slow water on the far side of stream bends is a magnet for ducks, but these hard turns present a challenge for gunners faced with difficult shooting angles and a tipsy seat. Set up the shot by approaching with the canoe tucked close to the inside bank. Then, just before the bow clears the bend, the paddler uses sharp pry strokes to swing the stern of the boat towards the middle of the stream. The good news: The ducks will jump straight ahead. The bad news: The shooter has no excuses. Blowdowns and beaver dams are common on many small streams, but they don’t have to block your way to the fine hunting that lay beyond them. Two paddlers in a canoe or johnboat can easily and safely cross such obstacles and stay dry as toast—if they know how. With a little practice, this maneuver can be accomplished in two minutes or less. But first, drift very, very slowly up to the obstacle. Ducks love to hunker down in the slow flow provided by a logjam or beaver dam. Make sure you kick out any ducks before attempting to cross. As you approach the fallen log or beaver dam, secure loose items in the boat—gear bags, water bottles, binoculars—that will shift as the craft is tilted over the obstacle. Turn the boat parallel to the obstacle. One at a time, each paddler carefully steps out of the boat and onto the dam or log. Keeping a hand on the boat provides stability. If the footing on a blowdown is particularly slippery, straddling the log may provide additional security. This is the tricky part. In streams with high flow, be very careful not to tilt the boat upstream so that the water can catch the gunwale and flip it. Face each other on the log or dam and turn the boat perpendicular to the obstacle, with the bow between you. Now lift the bow of the boat onto the log or dam, and work together to pull the canoe or johnboat up and over the obstacle. Turn the boat PARALLEL to the blowdown or beaver dam, and carefully board. 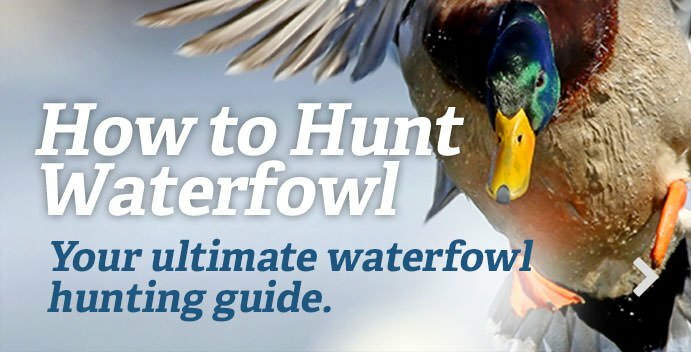 Once you've mastered these skills, all the normal frustrations of a duck hunter will vanish—crowded public marshes, frozen ponds, having to hunt the same piece of water morning after morning. Now there's only one last skill to commit to memory. For your post-graduate work, reread the beginning of this manifesto. There's a lesson in there: Once you find a ducky stretch of river, don't tell a soul.